The Union Pacific Railroad's Credit Mobilier scandal during President Ulysses S. Grant's administration lead to a congressional inquiry that included the following testimony taken from Collis Potter Huntington of the Central Pacific Railroad so that the practices of the two railroads could be compared by the committee. "The Credit Mobilier was a construction company created by leaders of the Union Pacific Railroad in 1867. The company was exposed five years later as one of the major scandals in American History, damaging the reputation of politicians and businessmen alike." "The Credit Mobilier scandal of 1872-1873 damaged the careers of several Gilded Age politicians. Major stockholders in the Union Pacific Railroad formed a company, the Credit Mobilier of America, and gave it contracts to build the railroad. They sold or gave shares in this construction to influential congressmen. It was a lucrative deal for the congressmen, because they helped themselves by approving federal subsidies for the cost of railroad construction without paying much attention to expenses, enabling railroad builders to make huge profits.When the New York Sun broke the story on the eve of the 1872 election, Speaker of the House James G. Blaine, a Maine Republican implicated in the scandal, set up a congressional committee to investigate." 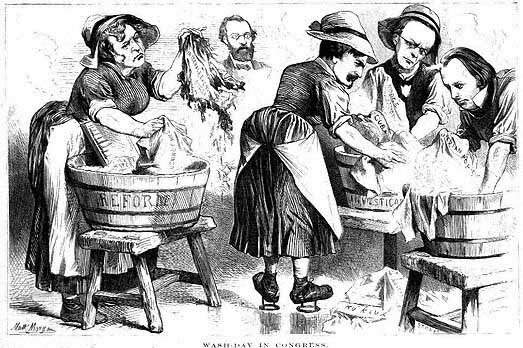 Wash-Day in Congress. From Frank Leslie's Illustrated Newspaper 12-30-1871. "The Committee to investigate the Credit Mobilier frauds made their report to the Lower House on Wednesday last. It recommends the expulsion of Oakes Ames for buying and selling votes, but did not censure any of the members implicated. It will be hard for the unsophisticated people to understand the subtle distinction in the moral turpitude of the man who buys a vote, and him who, acting under the solemnity of an official oath, deliberately barters it. For some reason the news of the report was not telegraphed ... "
CREDIT MOBILIER AND UNION PACIFIC RAILROAD. WASHINGTON, D. C., February 14, 1873. Question. Where do you reside ?—Answer. In New York. Q. Have you at any time been connected with the Central Pacific Railroad Company; and if so, in what way ?—A. I have been connected with it since its organization, which was in 1861, I think. Q. Are you one of the, original stockholders ?—A. Yes; I was among the early subscribers. Q. How much stock did you subscribe for originally?—A. I think my original subscription was fifty shares. Q. What was the whole amount of stock subscribed at the time of the organization of the company?—A. The laws of California, if I recollect correctly, required that there should be $1,000 a mile subscribed and 10 per cent. paid in; that had to be done before they could organize, and that was done. Q. Where are the business offices of the Central Pacific Railroad Company ?—A. They have been always kept in Sacramento. Q. Are the records, books, papers, and documents, relating to the Central Pacific Railroad Company, kept in the office at Sacramento?—A. Yes, Sir. Q. Do you recollect how many stockholders there were at the time of the original organization of the company ?—A. I do not. Q. Had the amount of stock required by law been subscribed at the time of the organization ?—A. I have no doubt but it had been; on all such matters we had our legal advisers, and they told us what was to be done, and we were always endeavoring to do everything exactly according to law, and just as our counsel reported about such things, that was done. Q. Do you know whether the 10 per cent. which was required by law had actually been paid in at the time of organization ?—A. I have no doubt about it. Q. Did you pay in your 10 per cent. ?—A. Yes; I paid mine in, and a good deal more, I believe. Q. Was that paid in cash?—A. Yes; I have no recollection of anything being paid in except in cash. Q. Who composed the first board of directors ?—A. Governor Stanford, Charles Crocker, Theodore D. Judah, Charles Marsh, Phil. Stanford, Mark Hopkins, and myself. I am not sure that there were more than seven directors. Q. Can you tell how many subscribers there were to the capital stock at the time this organization was effected ?—A. No; I cannot. I had a good deal of trouble in getting subscribers. Q. About how many were there?—A. I should think there were fifty or sixty. Our friends all paid down a little. I went up over the mountains and through to Grass Valley. I got a few subscribers there, and, a few at Dutch Flats, and a few at Nevada City. Q. Did those persons who were elected directors at this first organization hold the majority of the stock that was then subscribed?—A. I should think they did. Q. Have those persons whose names you have given continued in the direction of the company ever since ? If any of them have been left out, who?—A. Mr. Judah died. Q. Has Mr. Leland Stanford been connected with the direction ever since?—A. Yes. Q. Has Mr. Crocker?—A. No, Sir; Mr. Crocker was overworked and went out. Q. How long has be been out?—A. Some three or four years. Q. He continued in the direction from the organization of the company in 1861, until three or four years ago?—A. Yes. Q. How long did Mr. Judah continue in the management?—A. Not long. He came here to Washington and staid here till after the passage of the bill. Then he went back and was there some time—not over a year, I think. Q. How long did Mr. Marsh continue in the direction?—A. My impression is four or five years. Q. And yourself ?—A. I have been a director ever since the organization of the company. Q. How long did Mr. Phil. Stanford continue in the direction of the company ?—A. I cannot say. Q. Is he a director now ?—A. No, sir. Q. How long is it since he ceased to be a director?—A. I should think some four years. Q. Is Mr. Hopkins still a director?—A. He is. Q. Has he been so continuously from the organization till this time A. I think he has. Q. What is the amount of capital stock of the Central Pacific Railroad Company ?—A. The whole capital stock of the company is $100,000,000. The stock issued is about $54,000,000. Q. After the organization of the company what means were resorted to for the construction of the road ?—A. We commenced to build the road on our own means. We got some aid from the Government which we thought would let us through the mountains; but soon gold began to rise, (and we paid for everything in gold,) and we saw that we were going to have great difficulty. In fact, I made up my mind that we were -not going to get through with the Government bonds and first-mortgage bonds. We then went to the State legislature, and the legislature agreed to pay the interest for twenty years on a million and a half of bonds. Gold kept rising, and we saw that we were still going to have difficulties. Our engineer's estimate was $88,000 a mile for getting across. Iron was $40 a ton when the estimate was made, and it went up to about $140. The expense of going around the Horn and taking the war-risks was so great that freights went up very high, and we cast about again, putting in our own money all the time, which was considerable. About that time the city of San Francisco voted to give us $600,000, or to take our stock to the amount of $600,000 and to give us $600,000, of their 7 per cent. bonds. Afterward the work looked so heavy that they did not like to take the stock, believing it was of no value. We finally compromised with San Francisco, and the city gave us $400,000 and did not take the stock, and they considered they had made $200,000 by the operation, so that we got $400,000 out of the city as a donation. We got then something from Sacramento County and something from Placer County; and we got across the mountains, although considerably in debt. That I believe answers the question as to how we got our means to build the road. Q. What was the first contract that was let to build this road, and to whom was it let ?—A. I have not the data to state the exact time, but it was let to a number of parties. Mr. S. D. Smith had a contract. Q. For how much?—A. I think it was five miles. There were, I should think, eight or ten parties. I ought to know their names, but they are out of my mind now. We let it to them in that way, but there was a limited supply of labor there, and the parties got in one another's way. Several sections in advance were completed, and sections that were Dear were not completed; and we made up our mind that it was impossible to build the road in that way. Q. What number of miles of the road were embraced in those eight or ten contracts to which you have referred?—A. Without giving the exact distance, I think it was up to Dutch Flats, some seventy-four or seventy-five miles. Q. What was done then in the way of making contracts?—A. I was here. Our people cast about to get up a company to build the road . They did let the contract to the Contract and Finance Company. They sent to China for labor, and they sent over here tome for labor. Charles Crocker had a contract from the very first. Q. Was that before this Contract and Finance Company was organized?—A. Yes. Q. Was that on his own account or was it on account of a firm?—A. I do not know. I think some sections were let to Charles Crocker, and some to Charles Crocker & Co.
Q. Do you know who composed the firm of Charles Crocker & Co.?—A. I do not. Q. Had you any interest in that firm?—A. I do not know that I had. Q. Did you have any indirect interest in it?—A. No; I do not know that I had. Mr. Hopkins, my partner. who has been a partner of mine for twenty years in the hardware and metal business, and, in fact, in almost all the business I had, was attending to it on that side. I said to Mr. Hopkins, when I left, that in any undertaking there in the construction of the road he could take whatever interest he thought proper to take, but to take as little as he could, because we were doing a large hardware and metal trade, and I did not want to be embarrassed in it. I do not think he took any interest in it, but still I do not know. Q. Who else were in the firm of Charles Crocker & Co.?—A. I do not know. Q. How much of that road was embraced in that contract?—A. I do not know. Q. Do you know at what rate per mile it was let to Charles Crocker?—A. My impression is that it was let per cubic yard. Q. Do you know what this contract amounted to in the aggregate?—A. I do not. Q. Passing from the Charles Crocker & Co. contract and the Charles Crocker contract, state what you know in reference to the organization of a corporation known as the Contract and Finance Company, and the purpose of that organization.—A. It was organized, as I under. stood—I was not there myself—more particularly to gather up labor sufficient and to get means sufficient to build the road. Q. Was it organized also for the purpose of taking a contract for building the road?—A. That, I suppose, would follow. Q. Under what authority was this Contract and Finance Company organized?—A. Under the laws of the State of California, as I understand. Q. Who composed this company?—A. I cannot say. All of us cast about to get as many into it as we could. Q. What was its capital stock?—A. It was $5,000,000, I think; I am not positive. Q. Have you a copy of the articles of association, or charter, or whatever sort of instrument it was organized under?—A. No, I have not. Q. Do you recollect how many subscribers there were to its stock?—A. No; I never saw the subscription list. Q. Were you a subscriber yourself?—A. No; not myself. If I did subscribe, Mr. Hopkins, my partner, did it. Q. Did Mr. Hopkins subscribe?—A. I think be did. Q. Do you know to what amount?—A. I do not know. Q. What was the firm's name?—A. Huntington & Hopkins. Q. Did he subscribe in the firm's name?—A. I do not know. Q. Was Mr. Leland Stanford one of the corporators in that Contract and Finance Company ?—A. I do not know. Q. Was Mr. Charles Crocker?—A. I do not know; I never have seen the subscription list; but, from common report, he was. Q. Was Mr. Judah ?—A. Mr. Judah died before it was organized. Q. Was Mr. Charles Marsh ?—A. I do not know. Q. Were you an officer in the board of directors of the Central Pacific Railroad Company after it was organized?- A. Yes, sir. Q. What position did you hold?—A. I was financial agent at the East, and business manager, and I did most of the business here at the East. Q. I believe you stated that you are vice-president of the company now ?—A. I am. Q. When did you become vice-president of, the company?—A. My impression is on its organization. Q. Have you been vice-president ever since?—A. I believe I have. Q. Was there a contract let to this Contract and Finance Company for building the Central Pacific Railroad?—A. I think there was; I have never seen it. Q. Have you any doubt about it?—A. No, I have no doubt about it. Q. How much of the road was embraced in that contract?—A. I can give my impression; I cannot give the exact number of miles—about six hundred. Q. Have you a copy of that contract ?—A. I have not. Q. Do you know where it can be found ?—A. It is in Sacramento, I have no doubt. Q. When was that contract made ?—A. I cannot say. Q. Do you know who were the officers of this Contract and Finance Company at the time this contract was made?—A. Charles Crocker was president, but beyond that I cannot say. I am quite sure he was president. Q. What other persons do you know of being officers of that company ?—A. I do not know. Q. Did Mr. Leland Stanford have any interest in it ?—A. I do know. Q. Did you ever hear him say so ?—A. If I did I have forgotten it. Q. Was Mr. Hopkins an officer in that Contract and Finance Company?—A. I do not know that. Q. You were the vice-president of the Central Pacific Railroad Company; I will ask you to state now if you know what amount was paid to this Contract and Finance Company for building the road?—A. I do not know. Q. Have you any idea?—A. I have got an impression that they were to have so much in stock, and the balance in bonds. Q. How much in each?—A. My impression is that they took all the first-mortgage bonds and all the Government bonds, and a certain amount of stock. Q. How much stock ?—A. I do not know; I do not think I have ever heard. Q. Have you any impression on that subject?—A. No. My impression is that they took quite a large amount of stock. The price of the stock was merely nominal at that time. Q. Did they pay in the money for the stock which they took to the Central Pacific Railroad Company?—A. I would suppose that it would be counted cash on construction. Q. I simply want to know the fact whether they paid in the money or not.—A. I cannot say. I suppose that they did pay the money for the construction of the road. Q. You were the vice-president of the Central Pacific Railroad Company. Did you take any interest in the construction of this road?—A. I took great interest in supplying the materials. My associates in the company were gentlemen whom I had known twenty or thirty years, and Mr. Hopkins had been my partner for twenty-odd years. I had all confidence in them, and paid very little attention to matters myself. I shipped all the iron for the road, and all the locomotives, and all the materials; and that kept me very busy. They inquired very little about what I was doing, and I inquired but little about what they were doing. Q. Did you sell the iron to the company?—A. I never had any iron to sell. Q. Did you purchase the iron for the road ?—A. Yes. Q. By the contract with the Contract and Finance Company, was that company to build and equip this road?—A. Such is my impression. Q. Did you purchase the iron for that portion of the road which the Contract and Finance Company was to build?- A. I purchased the iron for the whole road for the Central Pacific Railroad Company. Q. Did you purchase it on account of the Contract and Finance Company?—A. I purchased all the materials for the railroad company. Q. After the contract had been let to this Contract and Finance Company to build and equip six hundred miles of road, why was the Central Pacific Railroad Company purchasing iron?—A. We purchased iron for the whole road and sent it out there; and the Contract and Finance Company, as I understood, took it at what it cost to lay it there. We had to buy the iron a long time ahead. We had to contract for it. Q. Had you already bought the iron when the contract was made with this Contract and Finance Company for these six hundred miles of road?—A. I should suppose we had; I am not positive. We had to contract in advance. I sent ten thousand tons of iron, if I recollect correctly, over the isthmus, for which I paid two cents per pound in gold for freight; and that was when gold was very high. I sent twenty locomotives over the isthmus, and I think I paid as high as $7,000 in gold as freight on them. Q. I understand you, then, that before this contract was let to the Contract and Finance Company, the Central Pacific Railroad Company had already purchased the iron for the portion of the road which the Contract and Finance Company was to build ?—A. Not all of it. I do not know that it had purchased any; but I should suppose that we had from our manner of buying in advance. Q. Then you are not sure that any of it had been bought?—A. No; not quite sure; but I think it would be quite safe to say that we had bought iron. Q. Had any considerable portion of it been bought by the Central Pacific Railroad Company before this contract was made?—A. I have not the data. That was during the war, in 1862 and 1863, and we bought along as fast as we could. I should suppose that some of it had been bought before the contract was let and some after that. Q. In what way did you pay for that iron which you bought for the Central Pacific Railroad Company? Did you pay for it in money?—A. Yes, we paid in money. We got time on a portion of it; it was a cash transaction, I think. Q. How long time did you get on it ?—A. I got twelve months on some of it. Q. I suppose that the Central Pacific. Railroad Company paid for this iron that was purchased by it?—A. Yes. Q. This Contract and Finance Company did not pay for it?—A. It paid the Central Pacific Railroad Company for it, I suppose. Q. I understood you to say awhile ago that this Contract and Finance Company got the Government bonds and the first-mortgage bonds ?—A. I do not state that positively; that is my impression. Q. If that is so, from what source did the Central Pacific Railroad Company get money with which to pay for this iron ?—A. I sold its securities here for the Central Pacific Railroad Company, and every month I gave our people a memorandum. Q. How long was this Contract and Finance Company engaged in building that portion of the road which was embraced in its contract?—A. I do not recollect. I think we built five hundred miles of the road in nine months. I know that they had to haul out everything that they used. There was only one man, I think, living between the Big Bend of the Truckee and Brigham City, six hundred miles; and everything had to be hauled that distance. Q. Do you know what profits were made by this Contract and Finance Company on that contract?—A. I do not. My impression is that there was nothing made but some stock of the Central Pacific Railroad Company. Q. How much of the stock?—A. I do not know; but some considerable. Q. About how much?—A. I cannot say. We used the stock sometimes to borrow money on, and we sold some. In fact, we had to use as collaterals everything that we had before we, got through. The stock would probably not have been good for more than 10 per cent. as collateral. Q. Do you know anything in relation to dividends having been declared by the Contract and Finance Company ?—A. No, I do not. Q. Did you ever participate in any dividends yourself?—A. Yes, I think I did. Q. What did you receive in the way of dividends?—A. It would be impossible for me to say. I was using a good deal of money, and was carrying on my hardware and metal business, and they were all mixed up together. What I got hold of I sold, and used the money again to pay debts. what you received them ?—A. I never received any Government bonds at all. Q. Did you receive any first-mortgage bonds?—A. I never received any first-mortgage bonds, I am sure. Q. Was there not a second mortgage on that road ?—A. No; we had land-grant bonds. Q. Did you get any of them?—A. I think I had a few of those land grant bonds. Q. And you had some of what you call State aid bonds, did you get any of them?—A. No. Q. How many land-grant bonds did you get I—A. I cannot say. I did not get many. Q. About how many?—A. I really cannot say how many. I got them a few at a time. Q. Did you get any stock?—A. Yes, I got some stock. Q. How much?—A. I do not know. Mr. Hopkins keeps a memorandum of that. Q. Do you not understand about how much stock you had of that company; have you no idea?—A. No, sir. Q. Can you tell the committee within one hundred shares how much stock you had?—A. No. Q. Can you tell within one thousand shares?—A. I do not think I can. Q. Can you tell within two thousand shares how much stock you had?—A. Yes; I think I can tell within one thousand shares probably. I should think I had something in the neighborhood of a million dollars of stock. Q. How much did your partner have ?—A. I do not know that. I suppose he has got about the same. We have bought and sold stock sometimes, and borrowed money on stock. Q. How did it happen that you received dividends in this Contract and Finance Company; I understood you to say that you are not a member of that corporation?—A. I certainly do not know. Q. If you do not know that you were, bow did it happen that you received this large amount of dividends of which you have spoken ?—A. I do not know. I trusted these things altogether to Mr. Hopkins. Q. Where did you get this million dollars of stock ?—A. I do not know that it was dividends. Q. If you did not get it as dividends bow did you get it?—A. We are pretty large operators in all kinds of securities, and may have got it in that way. Q. Did you buy this million dollars of stock in the open market ?—A. It was not sold in the stock-market. If it was bought it was picked up from contractors. Q. I want to know whether you did pick it up from contractors ?-A, I do not know. Q. Do you wish the committee to understand that you do not know how you acquired that stock?—A. No, I do not; but really I am rather ignorant of those things that were done on the west coast there.. As I said before, I had great confidence in my associates there. They did my business as they did their own. Q. Do you wish the committee to understand that you did not get this stock as a division of profits made by that Contract and Finance, Company?—A. No, I do not. Q. Do you wish the committee to understand that you did receive it as division of profits?—A. No; I am not positive about it. I said I had no interest that I was positive of in the Contract and Finance Company. I presume that I had, and I believe I so stated. Mr. Hopkins attended to that thing. Q. If you had an interest in the Contract and Finance Company, to what extent was that interest?—A. I do not know. Q. Can you give us any idea as to the extent of that interest ?—A. No, I really cannot. Q. Did you have five shares of stock in it, or an interest to that amount ?—A. It would be fair to presume that if I had any, I had considerably more than that. Q. Can you tell us within a hundred shares the interest you had in that Contract and Finance Company?—A. Really, I never saw the subscription list. Q. And have no idea of bow much you had?—A. Really, I have no idea; anti I do not know what the capital stock is. I believe it is five millions. Q. How many stockholders were there, as nearly as you can recollect?—A. I do not think I ever heard. Q. Who were the principal stockholders in that Contract and Finance Company?—A. I do not know that, for I never saw the list. Q. Had you anything to do with that contract?—A. Not that I recollect. I have been on this side. I have been here for eleven years, almost all the time. Q. By whom were the contracts made on the part of the Central Pacific Railroad Company to build this road?—A. The Central Pacific Railroad Company, I suppose, would represent the one side, and the Contract and Finance Company the other side. Q. I want to know who were representing the Central Pacific Railroad Company in making these contracts. Did you have an executive committee, a contracting committee, or in what way was it done ?—A. I do not know; I have not been in California probably (except for a few days at a time) in eleven years, and I never looked into these matters. Q. Do you know what the net earnings of the Central Pacific Railroad Company are now ?—A. I do not know. I can make a statement. The figures are easily obtained. Q. Do you know what its present indebtedness is ?—A. My impression is that the Central Pacific Railroad Company owes little or nothing outside of its bonded debt. We have taken great pains to make the Central Pacific Railroad a solid, paying road. Wherever we could ran branches to advance the interest of the main road we have done so. I have attended to matters on this side, and can tell you pretty much if that has taken place on this side, but very little of the other side. Q. Do you know what the floating indebtedness of the company is?—A. My impression is that we may say we have no floating debt. We may have a small floating debt, but it is covered by cash, or by something equivalent to cash. Q. What has been done by the Central Pacific Railroad Company in the way of consolidation with other roads ?—A. There is the California and Oregon road; there is the San Joaquin Valley road, and there is the Western Pacific road. Q. And the Southern Pacific?—A. No; that is another organization entirely. It runs into another system of roads. There, is the Oakland road, I think, and there is the Alameda road. Q. Are those roads now all under the direction of the Central Pacific Railroad Company?—A. Yes. Q. And all controlled by the parties who control the Central Pacific Railroad ?—A. I, believe they are. Q. Was the stock of those roads purchased by the persons who control the Central Pacific Railroad ?—A. That was done by consolidation. It would naturally be by consolidation. Q. Are there any ferries connected with any of those roads ?—A. My impression is that those ferries at Oakland belong to the Central Pacific Railroad Company. Q. Any others?—A. No; except the one from Alameda Point. I think that belongs to the Central Pacific Railroad Company. Q. Do you think of any other ferries?—A. No, I do not think of any others. Q. What steamboat lines does this Central Pacific Railroad Company own ?—A. I think we own the line from Sacramento to San Francisco. That is a matter which I would not be positive about. I am answering these questions just as I think, and without positive knowledge. Q. Does the company own any steamship lines?—A. I think I am quite safe in saying that not one of us owns a share in any outside steamship stock. Q. I only have reference to the Central Pacific Railroad Company itself?—A. I think it has not any interest in steamship lines. I am quite sure it has not. Q. I believe you stated a while ago that you got some aid from Placer County, in California?—A. Yes. Q. Did the Central Pacific Railroad Company have some litigation with that county on account of the stock which the county. had subscribed ?—A. I do not know that it had. There was a party there who said he would commence a suit; but if he did I do not know. Q. Do you know what he was going to bring a suit about?—A. I do not know. Q. Are you aware of the fact that suit was brought in that county ?—A. No, I am not. I may have heard of it; but if I have it has passed. out of my memory. Who was president of this Central Pacific Railroad Company when you began to be its vice-president?—A. Leland Stanford, I think. Q. How long did he continue to be its president?—A. I think from that time to this. Q. Who was the active man of the Central Pacific Railroad Company during the period of the construction of the road ; and who would be able to give the committee most information in regard to those matters which you have been asked about?—A. My impression is that Mr. Stanford would, or Mr. Hopkins, or Mr. Crocker. Up to a certain time, Mr. Crocker would know more about it than anybody else, but he would not be able to give, any information in regard to present matters. Q. Where are those, gentlemen whom you have named?—A. They are in California. Governor Stanford was hereafter this question came up, and staid here some few weeks. Q. Has the Central Pacific Railroad Company been in the habit of keeping in the eastern portion of the United States any books that would show the condition of its affairs and transactions?—A. No. Q. Never?—A. Never. As to purchase of materials, I have done all of that, and every month I have sent out a statement, and the people there put it on their books and distribute it. Q. Are there in the eastern portion of the United States any books now that will show the transactions about which the chairman has inquired; or would they have to be obtained from the Pacific side?—A. We never have kept any records of those things here. Q. Are there none here now as far as you know ?—A. No, sir. Q. What was the date, as nearly as you can tell the committee, of the organization of this Contract and Finance Company ?—A. It is a mere impression that I can give at best, and I might be years out of the way. I should say, however, that it was in 1865. Q. How much of the road had been made if any, prior to the organization of that company ?—A. I should say about one hundred miles. I may be out of the way in these answers. Q. Where did the one hundred miles begin at the western end ?—A. At Sacramento. Q. And running ?—A. Running eastward to the Sierra Nevada. Q. Bow was that constructed; was it by contract, or was it constructed directly by the Central Pacific Railroad Company itself?—A. It was constructed, I think, in small contracts. I know there was a good deal of trouble in getting labor. They said that they had great trouble in working up to the requirements of the law with these small contracts. Q. When was that one. hundred miles constructed which was made before the organization of this Contract and Finance Company ?—A. We got to work in 1863, I believe. Q. And you worked along till 1865 ?—A. Yes. Q. Did you draw upon that hundred miles the Government bonds to which you were entitled by act of Congress prior to the formation of the construction company?—A. I should say we did. Q. Had you disposed of those bonds, before the construction company came into operation, that you had so drawn, including the, first-mortgage bonds of the company ?—A. Yes, sir; I think we sold the Governments in advance of getting them. When I commenced buying, locomotives for the road we paid $11,000 each for them. We had subsequently to pay $32,500 for them. These things cramped us somewhat and we had to sell the bonds in advance, agreeing to deliver them when we received them. Q. What did you get for the Government bonds and the first-mortgage bonds prior to the date of the, construction company ?—A. We commenced Selling the Governments at, 90. Q. Is that the average price you got for them ?—A. My impression is, that was about, the average. They were a new thing, and we had some difficulty in disposing of them. Q. How about your first-mortgage bonds?—A. We sold those at 95. We had considerable expense in selling them ; — advertisements, commissions, &C.
Q. Were those contracts, which were let prior to the formation of the construction company let upon actual surveys and estimates, both of quantity and of cost?—A. Yes, sir; I think so. I know they were over the mountains, and, in fact, I am quite positive they were the whole distance. If it would be proper, I would like to say that in taking the material out for 600 miles, where there were no inhabitants, it was next to impossible to let the contract, except to one party, because the contractors at the front would never get any men ; all the others would pick them up before they got there. Q. I am now confining my inquiry to the one hundred miles let prior to the formation of the construction company ; that, you say, was let, according to your recollection, upon actual estimates ?—A. Yes, sir. Q. What did it cost, as near as you can recollect; I mean cost, in actual payments to men and materia, to build the road ?—A. My impression is that the road cost fully $100,000 a mile in gold. I heard the governor say the other day—I was refreshing my memory on the subject—that the three miles of snow-galleries cost us $100,000. That is where the snow comes down in avalanches, and we have galleries to cover the road. We have twenty-five miles of sheds, and they cost a great deal of money. Q. Now we come to this construction company period. Was that a corporation or a copartnership ?—A. It was an organization under the laws of the State of California. Q. The chairman puts in my hands what purports to be a bill in chancery of the 14th judicial district of California for Placer County, for which bill the county of Placer is plaintiff and a large number of defendants ; and on this point, in regard to the organization of the construction company, he calls my attention to a statement in the bill which I will read to you. One, of the averments is, “that afterwards, to wit, on or about the 18th day of November, 1867, the said defendants, Huntington, Hopkins, Leland Stanford, C. and E. B. Crocker, and diverse others, their associates and confederates, to plaintiff unknown, combined and confederated together to cheat and defraud the plaintiff and other Stockholders of the Central Pacific Railroad Company and the said Central Pacific Railroad Company, and fraudulently to acquire and appropriate, to themselves, without consideration or a just equivalent, large profits and gains and large amounts of the assets and property of the said Central Pacific Railroad Company, organized themselves and some of their servants and employés to plaintiff unknown under the laws of the State of California, into a corporation Styled 'The Contract and Finance Company,' for the purpose of taking contracts for the construction of subdivisions of the railroad all telegraph line of the said Central Pacific, and the appurtenances necessarily connected therewith, and the equipping and furnishing of the same." Now, the first question I wish to frame upon that statement is, whether this construction company was organized under the laws of the State of California?—A. As I understand it, it was. I guess there is no doubt of it. Q. Was that organization about the date of the 18th of November, 1867?—A. It may be if that statement says so. I supposed it was earlier than that. Q. Among the persons stated as forming that organization are included Huntington, Hopkins, Stanford, C. Crocker, E. B. Crocker. Were those gentlemen among the men who formed that organization ?—A. I do not know, except from common report. I have never seen the subscription book. Q. Were you one of those persons so associated under the laws of California?—A. I suppose so, if that answers the question. I believe I am the gentleman referred to there. Q. Did you yourself take part in that organization, or was your name used without your knowledge or consent?—A. If my name was used it was perfectly right and proper to be used. Mr. Hopkins had a right to use my name as he thought proper. I told him that whatever he did in regard to the construction of the road I would do also. Q. At this time were you an officer of the Central Pacific Railroad Company ?—A. I have been vice-president of the company from its organization. down to the present time. Q. Were you. a director also?—A. Yes, Sir. Q. Was Mr. Hopkins connected with the Central Pacific Railroad Company?—A. Yes, Sir; I think he has been director ever since it was organized. Q. Was Mr. Leland Stanford an officer or director of the company ?—A. My impression is that he has been president of the company since its organization. Q. Was Mr. C. Crocker also an officer of the road ?—A. I do not think he has been. I do not think he ever was with the board but a short time. Q. Was be a director at that time ?—A. I think not. Q. Was he a stockholder ?—A. I suppose so. Q. Was Mr. E. B. Crocker a director or stockholder, or both?—A. My impression is that he was a director; and you have to be a stockholder to be a director, as I understand the law. Q. At what date was the contract made for constructing a portion of this road by the corporation styled "The Contract and Finance Company"?—A. I could not say. Q. How much of the line of the road did the first contract which they took cover ?—A. I could not answer that. Q. Answer as near as you can.—A. I do not know. My impression is that the Finance Company built about six hundred miles of the road. Q. You said it was nearly impossible to let that road except in large tracts; was that true at the date or this letting—the first letting of the contract to the Finance Company ?—A. Yes, sir. I think that the committee will see that it would have been impossible when they understand the circumstances under which the road was built. The Union Pacific people were pushing on with fearful speed and reckless expenditure to drive us out of the Salt Lake Valley—to drive us out of that business. We did not expect to have any local business on the four hundred miles of the eastern portion of our road, although I am happy to say it has since been developed and proves to be very satisfactory. We felt very anxious to have the road reach the Salt Lake Valley, so as to participate in that trade, and we thought it a vital point that the road should be pushed on to meet the Union Pacific about where we did meet it. I made an overland trip across the continent of thirteen hundred miles in the winter to see bow they were getting along. They were moving camps, paying double wages, &c.
Q. At the formation of this constructing company, what proportion. of the stock of the Central Pacific road was owned by the persons that became members of the Contract and Finance Company ?—A. I have no idea. Q. Was it half?—A. I have no idea at all. Q. Can you not approximate?—A. No, I could not. I never saw the books. Q. Do you know what amount of stock had been issued at this particular date, November, 1867 ?—A. No, I do not. Q. Another averment in the bill from, which I have read to you is, that after the organization of the Contract and Finance Company, all the contracts made and entered into in the name of the Central Pacific Railroad Company for materials to be furnished and for work to be done were by Leland Stanford, Charles Crocker, and their confederates, composing a majority of the directors of the Central Pacific Railroad Company, voted to be let, and were in fact let, and entered into by the Central Pacific Railroad Company of the one part- and the Contract and Finance Company of the other part, without advertising the same, and without in any manner inviting competition therefor. Now, the first question I desire to ask you is, whether at that date you had any personal knowledge of' that first letting to the Contract and Finance Company ?—A. My impression is that I did not know anything about it at that date. Q. Tell me whether you were in California at the period of the first letting.—A. There was three years that I was not in California at all if I recollect correctly, from about 1863 to 1866. Q. Were you present at any meeting or interview which had regard to the formation or organization of this Contract and Finance Company?—A. My impression is that I was not. If I had been in California I should have been at the meeting, and I have no recollection of being there at the time. Q. Who represented your interest in the matter ?—A. Mark Hopkins is my partner. Q. He was there?—A. There would not have been much done for me unless he was there. He lived in California at that time. Q. What is the fact as to the first contract being let, as stated in this bill, without in any manner inviting competition, or advertising?—A. I should have considered that to have advertised would have been so much wasted as was paid for advertising. Q. That is not the question. The question is whether it was advertised ?—A. I do not know. Q. You know nothing about the fact ?—A. No, sir. Q. What extent of road was let in the first letting to the Contract and Finance Company ?—A. I cannot say. I am quite familiar with most things done on this side, and I know very little about the matters done on the other side. Q. Do you know what the stock that was owned by the persons who entered into and became members of the Contract and Finance Company cost in cash to those who then held it ?—A. I do not know. The stock that we took originally was paid for at par, but much of it was taken by the friends of the enterprise. This man took $1,000 and that man took $1,000, saying that they were willing to give that in order to get the, railroad, and that they never expected to see any dividend. Q. Was that which was originally subscribed paid up in cash, as far as you know, according to the requirements of the charter?—A. I suppose it was. Q. Was yours?—A. I suppose it was. Q. You do not know ?—A. Mr. Hopkins attended to all those matters. I do not suppose that any stock was issued until it was full paid. Q. Now, take that which was not originally subscribed, but Which was owned by those gentlemen who went into the Contract and Finance Company, and tell me what it cost them.—A. That I cannot say. Q. Can you tell what yours cost you which you then held and did not originally subscribe for ?—A. No; I have not any idea. Q. Would ten cents on the dollar be about as near as you can tell?—A. I suppose my stock cost me a good deal more than that. The trade along the line of the road is developing, and it looks now as though the stockholders would all get dividends before a great while. Q. I find the next averment in this bill to be that under the fraudulent and illegal pretense of paying for the said materials, work, &c., which really in fact had been furnished and done by the said directors and confederates for their own benefit, the said last- mentioned directors and confederates from time to time voted to pay and deliver, and make over in the name of the Central Pacific Railroad Company to the said Contract and Finance Company and its confederates, large sums of money, and large amounts of bonds, lands, and other valuable assets of the said Central Pacific Railroad Company of great value, to wit, of the value of $225,855,618.17. Now, do you know of any dividends made to the Contract and Finance Company at or about the period of November 6, 1867 ?—A. No; I do not. I do not know where they got those figures, because that is twice the value of everything we have. Q. Do you know of any division or payment made in the way of division of profit by the Contract and Finance Company to its members?—A. I do not know. I cannot answer the question. I have no doubt but that they have made some dividends. Q. You said awhile ago, in answer to the chairman, that you had received dividends, or something that amounted to that, and that as near as you could state the amount of the stock that you held amounted to $1,000,000. State whether you wish to be understood that that $1,000,000, or whatever the amount is, is what you have derived in the way of dividends as a member of that Contract and Finance Company? —A. I cannot say. Q. Who call say ? Tell us where we can get the information which we seek on that point.—A. If Mark Hopkins does not know I do not know where you call get it. We have endeavored to construct everything on high grounds. Q. This Contract and. Finance Company you have said was a joint stock company?—A. It was an organization under the laws of California, as I understand. Q. What amount in. dollars was each share of stock?—A. One hundred. dollars, I think. Q. How many shares did you and your partner own ?—A. I do not know. I have not the most distant idea. I am sorry to say so, because if I had an interest there I should like to know just what it was. I do not know anything about it. Q. Do you know how that stock of the Contract and Finance Company was paid for?—A. I do not know. Q. Who supplied the funds to pay for the shares of the Contract and Finance Company which you and your partner owned?—A. I do not know. That was in California, and was something that I did not know, anything about. Q. What is the stock of the Central Pacific Railroad Company worth now?—A. It has no market value; it never has been put on the market. It is growing in value, we think. The local business of the road is growing very fast, and we do not know what the stock is worth. Q. Have you any knowledge as to how many persons are now stockholders in the Central Pacific Railroad Company, and who are entitled to vote in its elections?—A. I cannot say. Q. Can you give us any idea whether they are a large number or a small number?—A. No; there are quite a good many. Q. How many men own a majority of its stock ?—A. I cannot answer that question. Q. Can you give us any idea whether they are few or many?—A. My impression is that there are not a great many. Q. As many as half-a-dozen ?—A. I guess more than that, a good deal. The stock has changed hands, and it has gone out. Q. Is not a majority of the stock of the Central Pacific Railroad Company owned now by less than a dozen men or a dozen firms and men put together?—A. That is possible. Q. Do you not understand that to be the fact—that less than twelve men or firms control the majority of the stock of the Central Pacific Railroad Company?—A. Without being positive, as I said, it is possible. Q. You say it is possible. Now give us your best information and knowledge in that regard.—A. I do not like to state a thing which I do not know. Perhaps I may say it is probable that it is controlled by a dozen. Have you not an impression upon that subject?—A. It is rather my impression. Perhaps that is a better word. Q. What is that stock worth now, as nearly as you can tell, to men who should want to invest in it?—A. It has never declared any dividend. I really do not know. I suppose that if we should go and offer the stock on the. market it would bring very little. I think pretty well of it. Q. Would it bring anything from the men who are most intelligent about its affairs?—A. I doubt whether it would bring anything if you offered $1,000,000 of it on the New York stock board to-day. Q. Offering the quantity that would command the best price and competition from purchasers, and offering it to the men who knew the most about the prospects and condition of the company, what, in your judgment, would be a fair price for the stock ?—A. I think that if the Government would give up to its contracts with the company, and if the company was not to be disturbed. Q. Understand the question. Taking things as they are, the question is, what that stock will bring from men who are most intelligent as to its affairs, and as to everything that affects its affairs, as things now are?—A. I have hardly anything, to base an answer upon. The parties who have got it, so far is I know, have got all their money in it, and have not got much money to buy any more; and if you were to go out and try to pick up new men, I have no idea that you could get any price for the stock. Q. Is it not changing hands somewhat?—A. Not much. Q. To any extent?—A. I have not known of any sales for a long time. Q. What prices did the stock bring- in the sales that are known to you as last made ?—A. I do not recollect any sales being made in a considerable time. Q. Have you bought any of the stock of the Central Pacific Railroad Company for money ?—A. Yes; I bought some of the stock- a good while ago. Q. What did you give for it?—A. I do not recollect what I did pay. It was a good price. Judge, Sanderson, our attorney, stated at one time that he had some doubts about the increase of the capital stock, and I bought a little of the stock at about par. Afterward, he said he was entirely clear on the, matter, and then I refused to buy any more, It was a little stock out of the old $8,500,000. After he had stated that the things were clear in his mind, and that everything was perfectly legal, I refused to buy. There were only a few shares of it out that there were any threats about. Q. What amount of land-grant bonds, in the aggregate, have been issued by the Central Pacific Railroad Company ?—A. About $9,000,000. Q. About what amount has been sold by the company ?—A. That amount. The mortgage is $10,000,000. Q. They are secured by a mortgage on the land granted by Congress?—A. Yes. Q. Do you recollect about how much they realized to the company, and how the company got its pay for the land ?—A. My impression is that they went into the construction and equipment of the road. Q. They were put in by the company as pay for the construction ?—A. Yes. Q. The Contract and Finance Company got all those bonds, I suppose?—A. No; I suppose not. Q. Do you know what the Central Pacific Railroad Company got for those bonds that it sold itself, and that were not paid to the Contract and Finance Company ?—A. No, I do not. I did not sell them. The Central Pacific Railroad Company has, at this time, about $1,000,000 of those bonds. Q. Does the Central Pacific Railroad Company own any Of its first-mortgage bonds?—A. No, sir. The company does not own any of its bonds. Q. Nor any of the Government bonds either?—A. No, sir. Q. What has the Central Pacific Railroad Company got left in the way of assets ?—A. It has got about one thousand three hundred miles of first-class roads, as well equipped as any road in America, I guess, for its business. It has got the best machine shop in the United States, I believe. It makes its own locomotives and has put up as many as eight cars a day in its shops at Sacramento. Then it has about forty-six millions of stock. Q. You mean stock that has never yet been subscribed for or issued ?—A. Yes; the capital stock of the company is $100,000,000. Q. That represents no value except the value which inheres in the franchise ?—A. It is one of those things which, when the road pays dividends, will be a good thing to sell if the company wants to put down a double track. Mr. HOAR. But at present it is the mere right to acquire 46/100 of the 46/100 entire property of the road at the price of $46,000,000, or any similar proportion. Q. What else does the Central Pacific Railroad Company own ?—A. It has got about $1,000,000 of these land-grant bonds, and it has got some money. Q. How much money ?—A. I do not know; enough to pay its debts, I guess. Q. Can you not even give the slightest idea—$1.00, or $100,000,000?—A. It is not $100,000,000. I suppose the company ought to have from one to two million dollars. Q. It is your opinion that that is the amount it has ?—A. I think so. Q. And it has no floating debt ?—A. No floating debt. We have a little floating debt ; and then we have $1,500,000 of California and Oregon bonds, or Central Pacific bonds on that branch. Q. Then that is an undisposed of mortgage on your own property ?—A. Yes, but these bonds are marketable any day. Q. And the selling of them and realizing on them will increase by just that much your own debt, of course?—A. Of course it would increase the funded debt. Q. Now, on the other side, you have the indebtedness which is represented by the Government subsidy bonds ?—A. Yes. Q. That is how much in the aggregate ?—A. About $25,000,000, or a little over. Q. And your own first-mortgage bonds are how much ?—A. The same amount. Q. And that is the extent of your indebtedness, is it?—A. Yes, and $1,500,000 of State aid. Q. Is there anything else that you owe either on the main line or the branches?—A. Yes, on the San Joaquin Valley road we owe about $6,000,000. Q. How is that secured ?—A. By a mortgage on that branch. Q. They are, bonds issued and sold, and held by third parties ?—A. yes. Q. Does the company owe anything else on the main line or any of its branches?—A. Yes; on the California and Oregon branch. We put a mortgage on that, and the bonds are issued only as the road is built. We have it built to the amount of about $8,000,000, I believe. Q. Is that road also subsidized by the Government?—A. Yes; by a land-grant. Q. Not by bonds ?—A. No; only a land-grant. The San Joaquin Valley road has no land-grant and no aid from the General Government. That road is 150 miles in length. Q. What proportion of the annual interest accruing on the Government bonds has the Central Pacific Railroad Company paid to the Government, and how has it paid it ?—A. That I cannot answer, but it is a matter easily ascertained. Q. Can you state whether, in that regard, the Central Pacific Railroad Company has been dealt with in the same manner as the Union Pacific Railroad Company?—A. I suppose it has been. If the Government would give us its business, instead of sending it round Cape Horn, as it does, we would be able to pay all the interest. Q. Suppose the Government should require the payment of the whole of the interest that accrues semi-annually on these Government bonds, except what is paid by the company in the way of transportation, would the Central Pacific Railroad Company be able to meet punctually the interest as it accrues?—A. I have no doubt myself but that the Central Pacific Railroad Company can meet all its legal obligations. Q. That does not answer my question. My question is whether, if the Government should require the payment of all the interest on all its bonds, could the Central Pacific Railroad Company, in that case, pay that interest, and also pay the interest on the residue of its bonded debt as it falls due?—A. I have no doubt but that it could. We have just commenced putting down steel rails on the road, and we expect to have steel rails on all the road in five years. Q. What is in round numbers, as near as you can tell, the net annual earning of your road?—A. I have not the figures in my mind so clearly as to state it; I was looking over it the other day to see what was the net earnings after paying interest and everything, and it amounted to some $3,000,000. Q. Keeping out of the account all matters of interest, just contrast the gross earnings of the road with the outlay for running expenses, and exclude the wear and tear and the depreciation of stock and track, but simply subtract from your gross earnings the necessary running expenses, and state what the net earnings of the road are as ascertained in that way.—A. I understand the question to be bow much the road earns over its running expenses; the road earned this last year over its operating expenses about 60 per cent. ; we run the road for little over 40 per cent. outlay, and the gross receipts were twelve millions eight hundred thousand dollars odd. Q. Then your net earnings would be 60 per cent. on the gross earnings?—A. The earnings over operating expenses would be a little under 60 per cent. ; the operating expenses are over 40 per cent. but under 42, and the gross earnings were twelve million eight hundred thousand dollars odd. Q. Do you embrace in the operating expenses the cost of maintaining the road?—A. Most assuredly. Q. And the renewal of iron?—A. Yes. Q. You do not include in it the laying of new track for any considerable distance?—A. We have done so thus far. I suppose that this year we put in twenty miles of iron rail here and there, piecing up. This goes into the operating expenses. Q. You include, then, in your statement of a little over 40 per cent. for operating expenses, this renewing of the track with steel rails ?—A. No, not the steel rails, but the renewal of the track with iron rails. I presume the steel rail has gone into the construction account. Q. I understood you to say that there has as yet been no dividend paid, by the Central Pacific Railroad Company to its stock holders ?—A. That is the answer I gave. Q. Is it not your belief that the persons who have. been prominent in the management of the Central Pacific Railroad Company, including yourself, received considerable values either in moneys, bonds, or stock, as profits on contracts made for its construction ?—A. I do not think we have made as much as we would have made if we had not gone into the road. Q. I ask you if it is not your belief that persons active in the management of the Central Pacific Railroad Company, including yourself, received considerable values (I do not ask whether they were reasonable or unreasonable) as profits on contracts for its construction ?—A. I think Ave have. I think I have an interest in a contract of the Contract, and Financial Company, and I think I have made some money. Q. Do you. mean. to have me understand, by the mode in which you answer that question, that any doubt exists in the mind of yourself that you have received yourself, while an officer of the Central Pacific Railroad Company, considerable values, either in money, bonds, or stocks, as profits upon contracts made for its construction ?—A. I think I have. I have received no money. Q. The question I now put to you is, whether you mean the committee to understand. from the way in which you make that answer that you have any doubt on that subject in your mind ?—A. I am not so clear as I would like to be. Q. Be good enough to attend, to my question. Have you any doubt in your mind that you have received considerable values, while a stockholder and officer of the Central Pacific Railroad Company, as profits on contracts made for its construction ?—A. If I have received them at all it is as a stockholder in the Contract and Finance Company. Q. I do not care whether you have received them as your share of the profits made by a company of which you were a member, but simply whether you have received as profits on contracts made for its construction considerable values ?—A. I think I have. Q. Have you any doubt of it?—A. I have doubts about the course, but I presume I have some paper stock. If there have been any profits made by my partner I have got some of them. Mr. HOAR. I am going to put that question once more, and to ask you to give a frank answer to it. The WITNESS. I will endeavor to do so. Q. Have you any doubt that you have received, while an officer of this Central Pacific -Railroad Company, considerable values as profits on contracts made for its construction, either in stocks, bonds, or otherwise?—A. The only question in my mind is, whether I have received any, considerable value. I would say that I have received, no doubt, some value. The "considerable" I would not want to say. Q. Is not the nominal value of the stock which you and your firm have received as profits on such contract.,; more than a million of dollars?—A. No, I do not think I have received a million of dollars, or anything like that, in money's worth. Q. I ask you if the nominal value. of the stock is not more than a million of dollars ?—A. I should think something thereabouts. Without saying positively, I should think something approximating-thereto. Q. In stock of the Central Pacific Railroad Company. Yes. Q. Have you not also received considerable values in bonds or other obligations to pay money, as such profits ?—A. I have received some; I do not know what. Q. I am inquiring simply as to your belief as to what you or your firm have received as your share of profits on contracts for the construction of this railroad. Now I ask you if it is not your belief that your firm have received, in the shape of bonds, or other obligations to pay money, considerable values as your share of such profits?—A. My impression is that we have received some values. Q. In bonds?—A. Yes; some values. Q. Is not that value in bonds which you have received more than a hundred thousand dollars, according to your belief?—A. I should think very likely it would be. I should like to ask Mr. Hopkins, if he were here. Q. So should I. Is it not, according to your belief, more than $500,000 which you have received in bonds?—A. No, sir. Q. Give us your best judgment of the amount which you have received in bonds—yourself and your partner?—A. I would like to answer that just as it is, but I have not the data, really, to give an intelligent answer to it. What is the question? Q. I ask you to state, according to your best judgment, the values which your firm has received in bonds as your share of the profits from the contracts for the construction of the Central Pacific Railroad while you were an officer?—A. I really have not the data to give an intelligent answer. I said a hundred thousand dollars because I think it ought to be more than that. Q. You have said that, in your judgment, it was more than $100,000 and less than $500,000. Can you state it any more nearly than that somewhere between one and five hundred thousand dollars?—A. No; I do not know that I would want to. Q. Is it not your belief that the practical control of the Contract and Finance Company which constructed this railroad, and the practical control of the Central Pacific Railroad Company, for which it was constructed, was, at the time of the contract for its construction, and during the execution of that contract, in the same persons?—A. It is my impression. Q. I do not know what precise meaning you give to the word "impression." I ask your belief.—A. It conveys the same idea, I suppose. Q. The question is whether it is not your belief that the practical control of the Contract and Finance Company and of the Central Pacific Railroad Company, at the time of the making of the contract for the construction of the road, and during its execution was in the same parties ?—A. My impression is that it was. I should like to say that I spoke to a good many people to go into that road, and almost every person refused to do so; and we had great trouble in getting people. Q. Does your company have agencies in the principal Atlantic cities, or any of them, to make contracts for freight and to look after its freight interest—?-A. We have a man in New York. Q. Do you have any connection with that-any supervision ?—A. No, Sir; that is under the superintendent. Q. Does your company have a treasurer or a treasury in New York ?—A. No. Q. Where does it pay its interest ?—A. At Fisk & Hatch's, in New York. Q. Do you have any supervision of that?—A. I generally look after it. Q. How much looking after does it require on your part?—A. Well, I see that the money is there to pay the interest. Q. Twice a year ?—A. Yes, Sir. Q. The money is sent from California?—A. Yes, sir. Q. What are the matters on this side which you say you attend to?—A. Well, I attend to buying all material. Every day I get orders from California. Q. Material for the maintenance of the road?—A. I just got an order yesterday for ten locomotives. Q. I do not care to go into details. I see that is an important duty. Now what other duty do you attend to besides buying material ?—A. I am president of the Chesapeake and Ohio road. Q. I do not mean other business. You describe your office as attending to matters on this side. I want to know generally what you attend to ?—A. I do not think of anything else. Q. Are there any other officers or servants of the road on this side except yourself, the freight agents, and the men who pay this money to the bondholders ?—A. No, sir; there are no other agents on this side. Q. What is the salary of the president?—A. I think it is $10,000. Q. What is the salary of the treasurer ?—A. I think it is $10,000. Q. And of the vice president?—A. I think it is $10,000. It is credited to me out there, and I draw upon it from time to time. It was $10,000 a year, and I suppose it is that yet. Q. Do you have a compensation. or commission in addition to your salary for the purchase of these materials?—A. The last monthly statement I sent out to California was one million and odd dollars. I send out every month a statement and they take it and put it on their books, and I have never made one shilling out of it as percentage or commission. Q. I am not directing any inquiry which has for it the purpose of investigating whether you have dealt honestly with the company or whether you have been improperly paid. I do not mean to suggest that there is any doubt in my mind about your honesty. I simply want to know whether, in addition to this salary of vice- president, whatever it may be, you have employment for the road which warrants the payment to you of a commission or a percentage ?—A. No, Sir; there is none. I never got one cent commission from the road. Q. In the first place his duties, as I understand, are subordinate to you—that is, they are conducted under your general direction.—A. Yes, Sir. Q. Now, what are the duties?—A. I have known General Franchot for thirty years. He is a son of old Judge Franchot, of New York. I got him in 1866 to come here to look after some land matters in the Interior Department, and certain matters in the Treasury Department, and Commissary Department, where we get our money for the Government freight, and also to attend to other matters here. If we should. have any matters before Congress, he could go before the committees and make such explanations and statements as were necessary. Q. What proportion of his duties, so far as you understand them, consisted in going before Congress; is that any considerable proportion?—A. That is, perhaps, a considerable proportion. We have now a bill before Congress—the Goat Island bill. Perhaps it is an even chance that they are going to force us 68 miles around the city when we are within seven miles of it. Q. Is it any considerable portion of his duties to appeal to members in private conversation so as to bring the interest of the road to their knowledge, and urge upon them the views which the road entertains in regard to pending questions?—A. General Franchot's business, if you will allow me, is to enlighten members of Congress on the merits of anything we may have before Congress. Q. Does a considerable proportion of his business consist in what is ordinarily known as lobbying ?—A. No ; I do not consider it lobbying at all. He is the, agent of the Central Pacific Railroad Company, and a gentleman, I believe, above reproach. I have known him for thirty years. Q. Were you here with him during the session of 1864 at the time of the passage of the railroad legislation of that year ?- A. My impression is, if you will allow me, that General Franchot was not here then, at all. Q. Who was here then doing, in behalf of the Central Pacific Railroad, the services which you now say General Franchot does ?—A. I was here myself. Q. Did you expend, for any purpose while you were in Washington, any moneys belonging to any railroad company, or any stock, or bonds of any railroad company, or the proceeds of them?—A. If I understand the question, I answer no. If the question is whether I expended any money in Washington, I answer yes; but if I expended any money here at the Capitol, if you will allow me, I say no. Q. I am asking you whether you made any expenditure of the character I have mentioned. I do not, of course, mean your hotel bills, but any expenditures of the character described. I do not confine my question to expenditures in regard to Congress. The WITNESS. I wish you would repeat the question. Mr. HOAR. The question is, if, while you were in Washington during the session of Congress of 1864, you expended for any purpose or disposed of any moneys belonging to any railroad company, or any bonds or stock of any railroad company, or the proceeds thereof?—A. No, sir; I did not, to the best of my knowledge and belief. I speak more from my way of doing things than from any recollection. Q. Do you know of placing in the bonds or under the control of Joseph B. Stewart, by yourself or anybody else, any cash, bonds, or stock of the character I have described ?—A. I saw in his testimony that he says I gave him $2,000 in cash. I have no recollection of it, but if be says so it is probable I did so. Q. For what services did you give him $2,000, to your recollection ?—A. I came here in 1864. I had no experience in these things, and have not now for that matter. I met Joseph B. Stewart. I recollect him as being a man who was said to have considerable influence here, to be used in the proper way. Q. Have you any knowledge of any transaction by which Mr. Stewart acquired a sum exceeding $200,000 in railroad bonds?—A. I know nothing about it. Q. You heard of no such transaction ?—A. Nothing but what I have seen in the newspapers lately. Q. Did you make any contracts here in behalf of any railroad you represented ?—A. No, sir; I have no recollection of it. If you mean I used any money, I say positively no. Q. Did you employ Mr. Alexander Hay for any purpose during that session ?—A. I do not think I know Mr. Hay. Q. Mr. Alexander Hay is an elderly gentleman, who says he has been a practicing lawyer for a good many years, and on intimate relations with Mr. Stewart, and he says he took an active interest in getting the act of 1864 passed, at the instance of Mr. Thomas C. Durant, Mr. Stewart, and of a California gentleman named Huntington, who he believes was vice-president of the Central Pacific Railroad Company?—A. It I ever saw Mr. Hay I have no recollection of it now. Possibly he is correct if he says he did know me. Q. He says be received a sum of between five and thirty thousand dollars for the services he rendered at the instance of those gentlemen?—A. If he got any from me I don't know how he got it. Q. You say you don't know Mr. Hay? I will read you a portion of his, testimony: " Mr. Huntington, a short time before the passage of the act of 1864 through the House of Representatives, stopped at my room. I said to him that the votes on the bill were so strong that I did not think they would call the yeas and nays on the final passage. He tapped me on the shoulder, and said if the bill passed in that way he would make me a present. I met him in New York a few days afterward, and reminded him of his promise, the bill having passed in that wily. He said he would see me in the afternoon, about it. I did not see him in the afternoon and have not seen him since." I understand you so say you have no recollection of employing this gentlemen ?—A. I have no recollection of meeting him, but if he says so, it is fair to presume that I did. Q. Do you know, or have you any knowledge or information from others, of any money or thing of value, whatever having been paid directly or indirectly to any member of Congress for the sake of interesting him in any mode in legislation in which the Central Pacific Railroad Company was concerned at any time or anywhere ?—A. No, sir; no. Q. Have you ever had such a transaction reported to you by any gentleman, or by any person with whom you consulted about railroad matters, as financial agent?—A. No, sir; never. Q. Do you make that denial comprehensive enough to cover all the time you were connected with the Central Pacific Railroad?—A. Yes; and I say that from general principles rather than from remembering everything I have done for the last ten years. Q. Have you any knowledge of any transactions which took place in 1863 and 1864, before the passage of the act of 1864, with any northwestern railroad company, the effect of which was to remove their opposition or the opposition of persons interested in them to the passage of the act of 1864. I refer to an Iowa or Kansas road?—A. No; I have not. I did not know much about those things; I was pretty busy about my own matters. Q. Did you have any negotiations with Mr. Ballet, or General Frémont, or his agent ?—A. No ; I am happy to say I never did. Q. I understand you that all the archives of the road—the engineer's estimates, and reports as to its construction, the accounts for disbursements of money for general purposes—are on the other side?—A. I have never had any records of the construction department on this side. Q. Where are the offices of this contracting company?—A. In Sacramento, I believe; they are in California. Q. Do you know whether they were in the same office as the Central Pacific Railroad Company ?—A. I do not. My impression is that they were in the same block of buildings. Q. Were they not in the same room ?—A. No ; I am quite sure not. Q. In the same building?—A. I think they are in the same building. Q. Are not the, offices right together, in connecting rooms?—A. I think there is easy access from one to the other. Q. Are they not really in the same rooms—this contracting company's office and the office of the Central Pacific Railroad Company?—A. They are in the Stanford block, in Sacramento. Stanford owns 40 feet of it, I own 40 feet, and Mr. Hopkins has all interest in them, They are three separate buildings, and owned by three separate parties. The rooms above the stores are used for offices. The Contract and Finance Company occupy some of them, and the Central Pacific Railroad Company occupy some. Q. And all these offices. the Central Pacific's and the Contract and Finance Company's, are all connected, one with another ?—A. Yes, sir; I think so. Q. How was it when this work was going on, when the contract was being executed, was it the same ?—A. I was not there, but I presume it was as so. Q. Do you know whether the employés of the two offices were the same ?—A. I should think not. Q. Can you state in round numbers the present bonded indebtedness of the Central Pacific Railroad Company, including the Government bonds?—A. I think on the one thousand three hundred miles of road there are about $70,000,000 of debt. Q. When you speak of the gross earnings being about $12,000,000 a year, do you have reference to the earnings of the Central Pacific Railroad proper, or the earnings of the Central Pacific Railroad in connection with those other roads with which it is consolidated ?—A. We run it as one road. Q. You consider it all as one road ?—A. Yes, sir; as one road. Q. Are you paying any dividends on any of those roads with which it has been consolidated ?—A. No; we cannot pay dividends. Q. The bonded indebtedness on the whole one thousand three hundred miles is $70,000,000, is it not?—A. I should state, on figuring it up, about $75,000,000. Q. What is the rate of interest?—A. Six per cent. on the Governments, and 6 per cent., I guess, on everything except the State aids. The State pays the interest on those at 7 per cent. Q. Your interest account, then, would be about $4,200,000 a year ?—A. Yes, sir; about that—that is, counting Government interest. Q. Is that interest gold, or currency ?—A. The interest is gold. Q. The Government bonds are not gold?—A. No; they are currency. I believe the Government has never been called, west of Salt Lake, to do anything since we started in there. We have taken care of the Indians, and the forts have all been taken away. We have taken care of the Indians, and frequently at great expense. We have never called for a soldier on the line of the road. We are at considerable expense in taking care of them. Q. Is not that ultra vires for a corporation ?—A. No, sir; we do not give them anything strong—not a drop, not a drop. Q. Your operating expenses are about 42 per cent. ?—A. Yes, sir. Q. That would leave you about $5,000,000 a year over your operating expenses?—A. Yes, sir. Q. Your interest is $4,200,000 a year, and, together with your operating expenses, the total would be $9,200,000, and your net earnings are $12,000,000 and upwards, which would leave you ail excess of $3,000,000?—A. About that ; that is about as I have it in my mind. Q. What application are you making of this excess of $3,000,000 a year?—A. Well, we expect to pay some dividends by and by. Then we lire going to put down steel rails. Q. How long have you been receiving $3,000,000 excess?—A. Not until this year. Q. What was it last year?—A. We just paid the interest last year. We have been building continually; building these branches and strengthening the road in every way. All our surplus has gone into new roads. Q. Give to me in detail the elements that make up the $75,000,000 of bonded indebtedness on the road, mentioning each class of bonds separately.—A. There are the first-mortgage bonds, say $25,000,000 ; the Government bonds to a like, amount, $25,000,000 more; the land-grant bonds, $10,000,000; the San Joaquin bonds, $6,000,000; the California and Oregon bonds, say another $6,000,000; (about $8,000,000 of those bonds were authorized to be issued, but only $6,000,000 have been sold;) the Western Pacific, $2,700,000. There is a million and a half of State aids, on which we do not pay any interest, making a total of about $76,000,000. Q. These branches include all that go to make up the aggregate of 13,000 miles of road ?—A. Yes, sir. We are rather proud of what we have done for the Government over there. Q. I have been directing your attention to these things with a view of asking you one more question ; Mr. Shellabarger inquired of you as to the value of the stock, and you said that it is not selling on the market?—A. I would like to answer that, but I have not, any definite idea of what the stock is worth. I would not sell my stock for less than 50 cents. Is there anywhere, to your knowledge, any aggregate statement of the cost of this road to the company?—A. O, yes. Q. I do not speak of what they paid in stocks and bonds that were not worth par, but I speak of what the contractors actually received?—A. I do not know where you would arrive at that; as we make it up, the cost of the road is the bonded debt and stock. Q. That I don't care anything about. You are aware that the act of Congress under which you built the railroad provides that, whenever the earnings of the road amount to 10 per cent. on its cost, Congress then has the important right to legislate for the reduction of fares. Now is there anywhere in the archives of the company, or anywhere else, any record which will show what the real actual cost was, as distinguished from nominal values and paper transactions ?—A. I suppose the cost of the road would include discounts, interests, commissions, and all those expenditures that always follow the building of a road and the negotiation of its securities. Q. You are aware, of course, that if the entire capital stock of the road were $25,000,000, which was not paid for in cash but taken on these construction contracts, the holders of the stock would own the whole property of the road subject to its debts, whatever they might be. Now it would make no difference to the holders of the stock whether it was $25,000,000 or $100,000,000, divided precisely among the same persons. That would be a nominal and not an actual value. Of course, then, the amount of stock ought not to be taken as a basis for computing the cost of the road under the act of Congress unless it had in fact been given out by the company for so much money's worth received in road-building. Now have you any correct computation of the actual cost of that road in cash?—A. If you will allow me, I think there never was a road built but what a part of its cost represented a profit to somebody. I have lain awake, I presume, a thousand nights, since 1861, to find out where the money was coming from to pay our bills. Q. You don't seem to have found out enough yet to tell the committee about it ?—A. These are the facts; these things I know. The actual cost of the road is the bonds and the stock, in my opinion. Q. There is no computation in existence on any other basis that you are aware of?—A. No, sir; only the stock at its par value, and the bonds at their par value built a road in the western country, where, they gave me $10,000,000 after the work was done, and they made a better trade than I did. I had completed the road, and they gave me a bonus of $10,000,000. Q. You have given us some idea of what you probably got in the way of dividends, or profits, as members of this construction company; now will you tell us in round numbers what the company got in the aggregate?—A. No, sir; my impression is that we got the first-mortgage bonds, the Government bonds, and a portion of the stock for building the road. I do not think there was any illegitimate profit. Q. My question is this: It is not what was paid out by the Central Pacific Railroad in pay for work, but what was paid out to all the members of the contracting company in the way of profit?—A. I could not answer that. Q. Can you tell us, then, any reasonable approximation to the amount? —A. No, I could not. Q. Where can we learn that?—A. I suppose that Mr. Crocker could tell you; he was president of the company. So could Mr. Mark Hopkins, Leland Stanford, and Mr. Miller. Q. Is there any one in the eastern part of the country that can give us the information ?—A. No, sir; that matter has been attended to over there. The books are over there, and it is a matter I know nothing about. Q. Now this construction company that made that part of the road which it did make, of course kept books ?—A. I should suppose so. Q. Those books ought to show what they paid out for material and for work in completing their contract ?—A. I should think so. Q. And that will show us the cost of the road so far as the outlays of the construction company would show ?—A. I should suppose so; it would seem so. Q. Now, what is it you add (in ascertaining, under the act of Congress, the cost of the road, for the purpose of fixing the amount upon which dividends are to be made before Congress shall regulate the rates of fare;) what is it that you add to the cost of material for making the road and equipping it, and the cost of its depots and stations, and those other things enumerated in, the act of Congress which are to be done before the Government subsidies are issued—what do you add to this, as additional elements in making up the cost of the road ?—A. Well, the cost of the road would be simply what the road cost; and to get that you find out how many bonds of the road are out and how much stock. Q. That does not answer my question.—A. I don't know any other way to get at it. They made a fair contract to build the road—at least I have no doubt of it. I do not believe that a shilling has gone out that should not go out. I speak of that more from what I know of the men who were engaged in it. They are all high-toned, honorable men. Q. That still does not answer my question. Assuming that the construction company and the Central Pacific Railroad Company are one thing, are composed of the same persons, (and in dealing with the Government we will treat them as one,) then excluding all the profits that were made by the construction company, what did the Central Pacific Railroad Company pay out as the cost of the road for these various things that are enumerated in the act of Congress as the things which were to be completed before they should be entitled to the bonds of the United States; and in order to make my question more definite, let me read you from the act of Congress the things that are to be completed before the road is entitled to its bonds. The fourth section of the, act of 1862 contains the following: " That whenever said company shall have completed 40 consecutive miles [it was changed to 20 by the act of 1864] of any portion of the said road and telegraph-line ready for the service contemplated by this act, and supplied with all necessary culverts, viaducts, crossings, sidings, bridges, turnouts, watering-places, depots, equipments, furniture, and all other appurtenances of a first-class railroad—the rails and all other iron used in the constriction of the road to be of American manufacture of the best quality," &c. Now, what would you add as a part of the cost of the road to the cost of these things that I have just read ?—A. I do not know. A perfect first-class road wants many things. There are many things that enter into the cost of construction that you cannot enumerate. The engineer is generally allowed ten per cent. That enters into the cost of constructing the road. HOME | "Behind the Scenes in Washington ... the Crédit Mobilier Investigation"